2017 was filled with so many great releases. The year started out strong with blu-ray releases of Train to Busan (2016) and The Slumber Party Massacre II (1987) and III (1990) double feature. Collector's Editions of Poltergeist 2 (1986) and 3 (1988) followed soon after. The year settled in at around the beginning of February with us getting some great titles every month. February saw a rerelease of one of the most requested out of print titles: Ghost in the Shell 2: Innocence. We also had two surprise 3D releases with It Came From Outer Space (1953) and A*P*E* and we also finally got blu-rays for Slaughter House (1987) and The Gate (1987). So many great releases and many blu-ray debuts. 2017 was a great year for Arrow Video and its fans. We were given so many great releases this year, more than any other company (in my opinion, of course). They also gave us some serious Dario Argento releases this year as well. 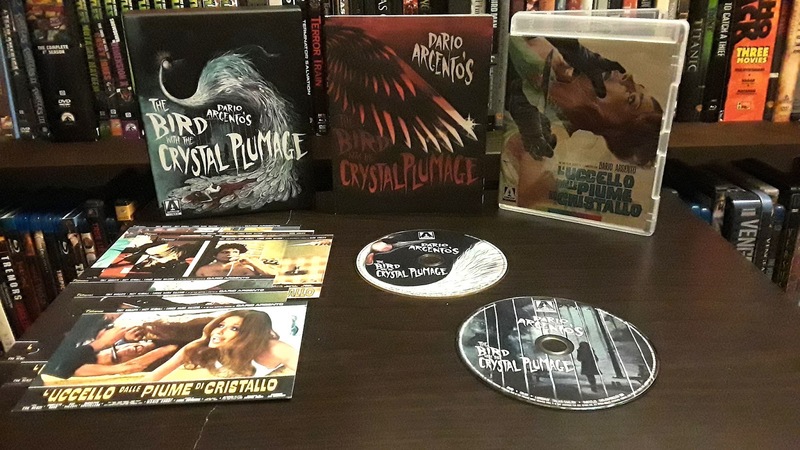 The Bird with the Crystal Plumage was Argento's directorial debut and he started out with a bang. With this film, Argento announced to the world that he was going to be a major player, not only on the Giallo scene but in cinema as a whole. The film is a wonderful example of style over substance, but the style is so good that we don't care that there isn't much to the story or the characters. Arrow Video knew that this was an important film and planned accordingly. This Limited Edition set comes packed with goodies both on disc and in the package. We get a commentary, a few video essays, and interviews. We also get a reproduction of the film's original theatrical poster and commissioned artwork from the wonderfully talented Candice Tripp. When the term "cult film" is brought up, the first film that I think of is Donnie Darko. The film is in a class of its own due to it not really focuses on one genre, but being a mix of several genres and doing so in a masterful way. Donnie Darko was a flop when the film was released in theaters, but gained an almost immediate cult following when it was released on DVD. From there the film would go on to one of the films that defined the 2000's. 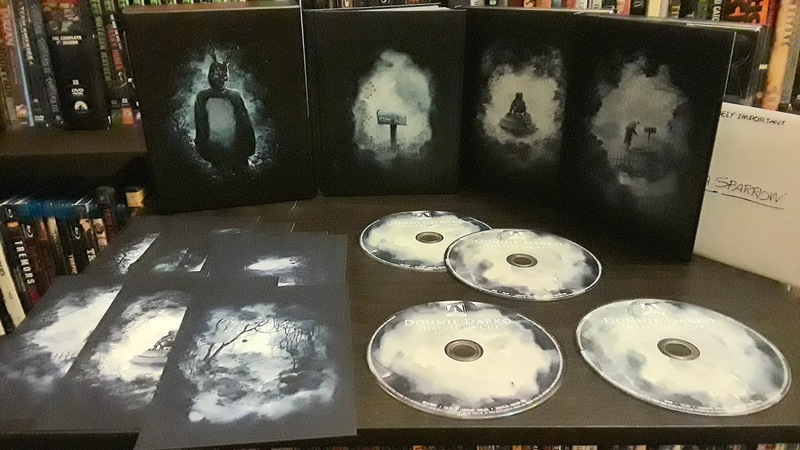 Arrow Video has taken Donnie Darko and remastered the film in 4K and the results are amazing. We also get both versions of the film, and while both versions have their strengths and weaknesses, I find that I like the theatrical version more due to the film leaving things open for interpretation and not holding our hand during the whole film. The blu-ray is also jammed pack with all of the special features that have appeared on the different DVDs and blu-rays that have been released throughout the years while adding some new features including a feature-length documentary about the making of the film from Ballyhoo Motion Pictures. This is the definitive version of Donnie Darko and will be for some time. That is how good this disc is. 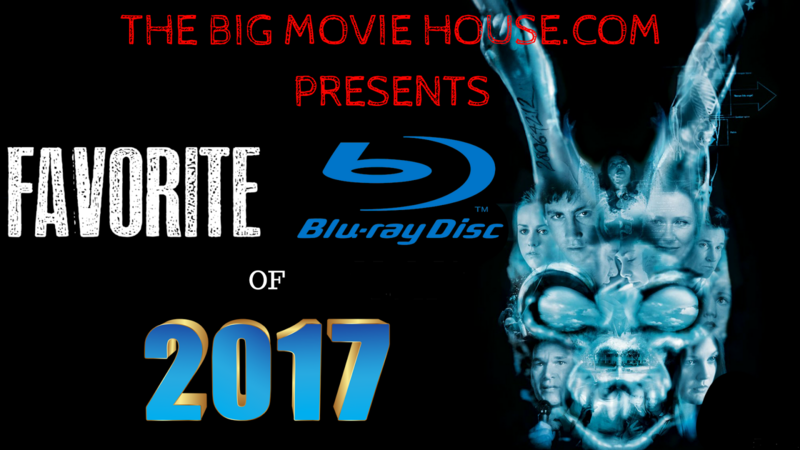 My review for Donnie Darko can be found here. Machete Maidens Unleashed tells the story of mostly American films made in the Philippines during the 1970's. Films like The Big Bird Cage, Black Mama White Mama, and Up From the Depths are just a few of the films made there and they are some of the best genre films to come out of the 70's. The film features tons of interviews and behind the scenes photographs and is entertaining as hell to watch. Electric Boogaloo: The Wild Untold Story of Cannon Films is an even better film than Machete Maidens. This one tells the story of the rise and fall of Cannon Films and its owner duo of Menahem Golan and Yoram Globus, two men Israel who came to America because they "wanted to make American movies". From there they would go on to make some of the most remembered films of the 1980's, although not many of them were that good. Machete Maidens never got a physical release here in the states, but the film did turn up on Netflix, which is where I first saw it. Electric Boogaloo, on the other hand, did get a physical release in the states, but only on DVD. 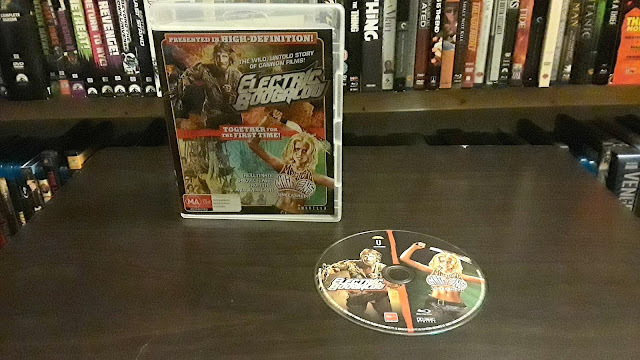 Umbrella Entertainment, an Australian company, sought to end this and made this double feature region free. The blu-ray is filled with special features, including extended interviews, a commentary track on Machete Maidens, and, for both films, an extensive trailer gallery for many of the films featured in both docs. The picture and sound quality are great, and while the special features are numerous, they are presented in standard definition only. This was not a dealbreaker for me, but it is for some. Beyond that hurdle, this release contains two films and tons of special features. That to me is a good thing. My Review for Machete Maidens can be found here. 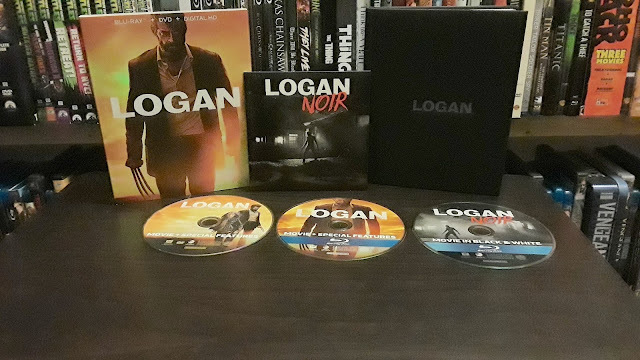 Being the only mainstream release on this list, Logan hit all of the right spots in terms of both the film and the blu-ray. The film is one of the best of the year, taking the comic book film as we know it into a new direction. The film is violent, but it is also full of heart. Hugh Jackman and Patrick Stewart give the best performances of their careers and go out on a high note. The blu-ray is spectacular. Of course the picture and sound are going to be outstanding as it is a brand new film (although that has never stopped a company from messing things up before). The special features are the biggest selling point here. We get a commentary track from director James Mangold that adds to the film’s rewatchability, deleted scenes, and a making of that has a somber tone to it. There is also the black and white version of the film, called Logan Noir. It is nice to see the film in a different light, and while I don’t get it for this film, I do get why filmmakers are keen in giving their films something new when they the home video market. Logan proved to be one of the best films of 2017 and so its blu-ray release sits on the list of the best blu-rays of 2017. My review for Logan can be found here. Released in the States as part of Quentin Tarantino’s short existing company Rolling Thunder Pictures, The Mighty Peking Man is Hong Kong’s take on King Kong featuring a man in a monkey suit instead of stop-motion animation. The film is filled with wonder and awe, but also some of the funniest things that you will have ever seen come out of the 70’s. It is a wonder that MST3K never covered this film as it is ripe for their attacks and jobs. The blu-ray, released in the U.K. by 88 Films, is outstanding. The picture quality is great and the sound fits the film perfectly. There is only one special feature, a commentary track with Hong Kong film expert Bey Logan, which is well worth a listen. The release also features a booklet with an essay written by Calum Wadel. This is a film that should be on blu-ray here in the states, but thankfully 88 Films saw that this film is worth the effort and gave us a great release. My review of The Mighty Peking Man can be found here. Phantasm series a full box set with all the bells and whistles that we have come to expect from box sets like this, and they did it with a series that has never been collected before in one release. Each film, outside of part 2 which is a direct port of the Scream Factory disc, has been remastered with brand new audio tracks and loads of special features. Also included in this set is a double-sided poster and a booklet featuring interviews with all the major players from the first film. Everything about this release is amazing for simply existing. 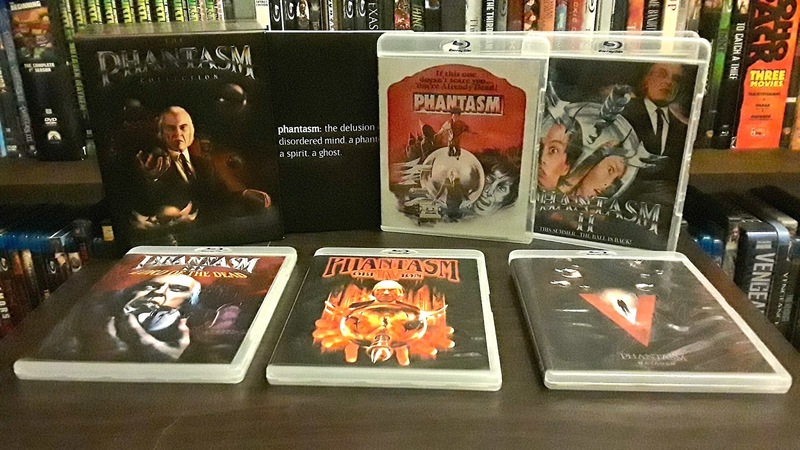 With many companies fighting over who gets to release what sequel or film, I still find it amazing that we can get box sets like The Phantasm Collection. My review for The Phantasm Collection can be found here. Phenomena is one of Dario Argento’s best films and it would seem right for the film to get one of the best blu-rays out there, give the best to the best. Arrow Video really went all out for this release. The remastered all three versions (the Italian release, the International release, and the U.S. cut “Creepers”) in 4K and the results are mind-blowing. I have seen scenes from the film in the past, but never did they look the way they do here. I fell in love with the film while watching this release and I think that it is the best possible way to do so. The special features are just as good as the picture quality. There is a visual essay that compares all three versions of the film and a brand new 2-hour making of doc that talks to many of the players involved with the film, sadly no Jennifer Connelly. Also, each version gets its own case with the “Creepers” version sharing its case with the film’s soundtrack, found on cd. The packaging is adorned with lovely artwork from the incredibly talented Candice Tripp. No one really thought that Scream Factory would be the company doing justice to the first film in the Silent Night, Deadly Night franchise, but they did and it was a happy surprise. With the announcement of the film being remastered in 4K and having both cuts of the film (theatrical and uncut, respectively), fans of the film could finally get rid of the joke of a release that was the Anchor Bay blu-ray. The picture of this new blu-ray is the standout feature. The film looks so good that many were saying that it was the best they had seen all year. Even the uncut bits, which were taken from a VHS version of the film because no film print could be found, was a step up from the older versions of the film. The audio got a bump too and sounds better than ever. Scream Factory did not skimp on the special features either. We got a brand new making of that featured a lot of the people that made this film happen as well as the special features that were found on the aforementioned blu-ray. 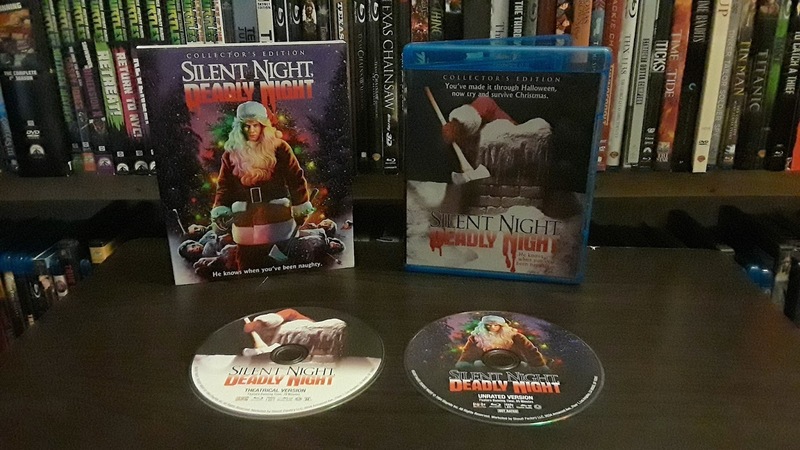 Top that off with one of the best slipcovers of the year and Silent Night, Deadly Night easily found a place in my best of the year. Suspiria was a film that I saw once and never really thought about again. That was back when the Anchor Bay dvd was released. 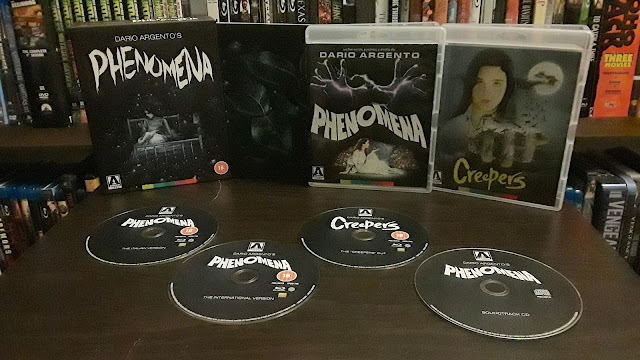 This year, the year of Argento, I have been discovering Argento films on blu-ray. 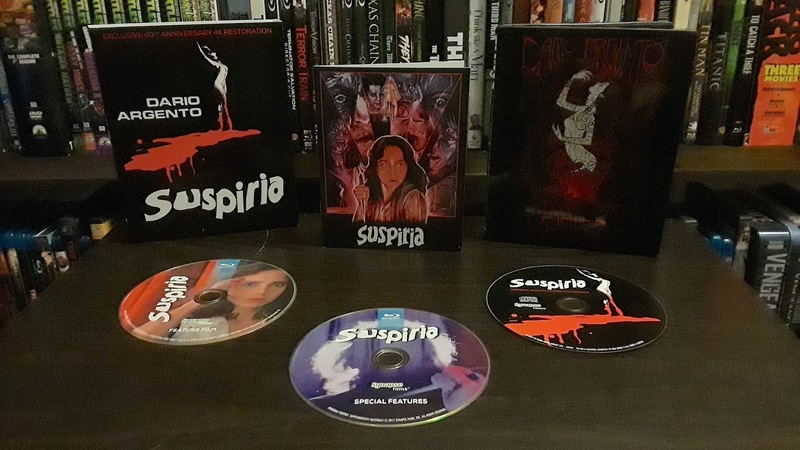 Every time that I would read something about Argento, Suspiria would come up. I knew that Synapse Films was working on restoring the film, but I had no idea when it was set to be released on blu-ray. To my surprise, Synapse Films, in August, announced that they were releasing the blu-ray, in a limited edition steelbook, at the end of the year. I could afford to preorder the blu-ray at the time, but when I got the money together, I did. It showed up at my house three days after Synapse announced that they began shipping the steelbooks out. The blu-ray instantly became one of my favorite blu-rays of the year and I hadn't even opened it yet. The steelbook looks great with some really cool custom cover art, both inside the steelbook and out. The booklet included has some great writings about the film and even goes into detail about the restoration of both the film and its soundtrack. The restoration of Suspiria is one of the best I have ever seen. I only had that one viewing of the film way back in the day, so there wasn't really anything for me to go off of in terms of comparisons, but I could tell that this was something special that I was viewing. The colors pop off the screen and blend so well with each other. I would really like the know-how Argento shot this film because I have never seen anything like it before. The soundtrack for the film, a 4.0 track, sounds incredible. Every line, every scare, every note of the mesmerizing Goblin score is heard loud and clear and like nothing before it. 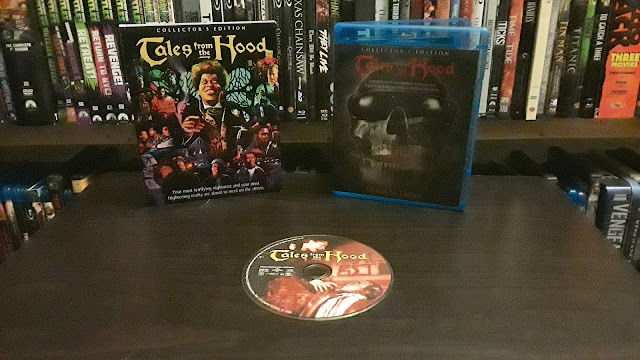 Tales from the Hood is one of the best horror films of the 90’s and still holds much of the power that it brought with it when it was released in the summer of 1995. The film is an anthology horror film that looks at issues that affect the black community like racism, black on black crime (otherwise known as crime), and rich white people who use black voters to get into office (seems very timely doesn’t it?). The film has gained a cult following but has always been on my list for most wanted blu-ray. Scream Factory heard the calls and gave us a great release of the film with all the bells and whistles that the film deserves. We get a great looking transfer that is very reminiscent of the film’s theatrical run. The sound is great as well. The special features list isn’t all that long, but it is powerful. A commentary track with the director has been ported over from the film’s laserdisc release and we are given a brand new making of. Couple that with the film’s theatrical trailer (which I can still remember shot by shot today) and you have a nice package for a greatly underappreciated film. So there is my list for my favorite blu-rays of 2017. Looking forward to 2018, there seems to be some heavy hitters coming to bat and, hopefully they deliver.